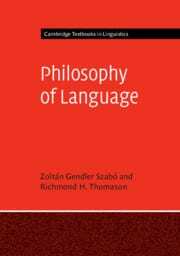 My main interests lie in philosophy of language and metaphysics. Among my current areas of research are the semantics of modality, tense and aspect, the relationship between lexical and ontological categories, and the nature of context. ‘Semantic Explanations.’ Oxford Studies in the Philosophy of Language, 2019. ‘What is a Quantifier?’ Analysis, 2018. ‘In Defense of Indirect Communication.’ Inquiry, 2016. ‘Major Parts of Speech.’ Erkenntnis, 2015. ‘Epistemic Comparativism.’ (with Jonathan Schaffer) Philosophical Studies, 2014. ‘Bare Quantifiers.’ Philosophical Review, 2011.